As the July 1 Free Agency period is quickly approaching, we continue our look at the current cap status of each team, and breakdown what they have, or don't have in terms of room to maneuver this off-season. Next up: the 2008 Cup Champions. 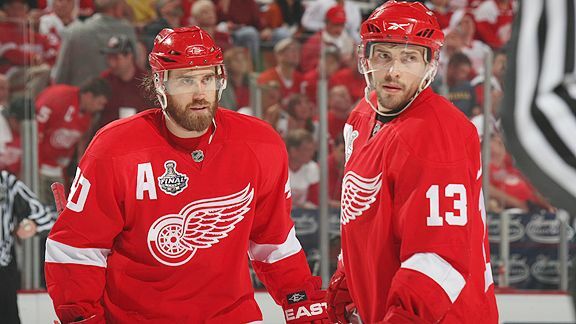 Analysis:Five minutes in to the off-season and the Wings are nearly set for next season. They moved quickly to bring back Lidstrom, Bertuzzi, Holmstrom, and "brought back" Jiri Hudler. Not a bad start! They also made a move to sign Valterri Filppula's big brother Ilari. With a couple million left over, Detroit should be able to re-sign most, if not all of the free agents that they want. Lidstrom's return means that they can allow Doug Janik another development season in Grad Rapids, but it also means that there will be no big free agent splash this summer. Bringing back Hudler gives the Red Wings more scoring depth and, of course, another run at the Cup for next year.